Dr. Blair was recorded in 2005 as part of a series for Pacifica Radio titled The New Nuclear Danger, based on Dr. Caldicott’s book The New Nuclear Danger: George W. Bush’s Military-Industrial Complex. Dr. Blair presents shocking and still-current information about the continuing danger of accidental nuclear war between the U.S. and Russia, with weapons on hair-trigger alert. Dr. Blair cofounded the Global Zero campaign to eliminate the world’s 24,000 nuclear weapons. At the start of the interview, Dr. Caldicott asks Dr. Blair about his experience as a Minuteman launch officer in the 1970s. Dr. Blair describes the strength of the weapons he was responsible for, their vast killing capacity, his emotional state during that time, false alarms he heard about, and the time his missile silo came close to launching its weapons. Dr. Blair provides an overview of the present hair-trigger alert status of U.S. and Russian nuclear weapons, and what it means for world security. He outlines the steps followed by government officials when a possible attack is perceived, in a chain of command leading to the president, who has a short window of time to decide whether to launch the U.S. nuclear arsenal. Dr. Caldicott is quite surprised how little time is allotted for such a momentous decision. She notes how few people know about the present situation with the U.S. and Russia each targeting each other with 2,000 nuclear weapons, ready to be fired by accident or design. Detonating as few as 500 nuclear weapons could cause nuclear winter and the end of all life on earth, as discussed in Dr. Caldicott’s interview with Professor Alan Robock. Dr. Caldicott asks Dr. Blair what is different between the 1970’s and now in the readiness of the U.S. and Russia to fight nuclear war. His startling answer indicates the high danger that remains, and points to the deterioration of the Russian early warning and command and control systems. Dr. Blair next describes the little-known dangers of terrorists hacking into the nuclear control systems in several different ways. Dr. Caldicott is flabbergasted at what she learns about these hazards. Dr. Blair mentions a secret Pentagon study that found an electronic “back door” to the Trident submarine launch controls. Read Dr. Blair’s 2003 column, Hair-Trigger Missiles Risk Catastrophic Terrorism. Dr. Caldicott asks if the U.S. maintains a policy for a preemptive nuclear war against Russia, and in his response Dr. Blair describes the frightening brinksmanship and spying that continues between the two superpowers. They ponder why there is no real oversight of the U.S. nuclear establishment, who continue to hold the world hostage to nuclear Armageddon. Near the end of the interview, Dr. Blair assesses the “misguided path of increasing danger” that the U.S. pursues with a military that thinks of more and more ways to use U.S. weapons. For more information on the issues presented in this program, watch Blair’s May 12, 2009 speech “Obama, Canada and the global movement to abolish nuclear weapons.”. Read Dr. Blair’s article De-alerting Strategic Forces, and Blair et al.’s article for Scientific American Who’s Got the Button? Taking Nuclear Weapons off Hair-Trigger Alert. De-alerting and sign Physicians for Social Responsibility’s petition to urge Obama to de-alert weapons. Also read Resetting the Nuclear Disarmament Agenda, Mikhail Gorbachev’s October 5, 2009 speech at the United Nations. Dr. Caldicott conducted an interview with Napoleoni, the bestselling author of Terror Incorporated and Insurgent Iraq. Napoleoni was a Fulbright Scholar at Johns Hopkins University and a Rotary scholar at the London School of Economics. She is an expert on the financing of terrorism and advises several governments on counter-terrorism. Her work appears regularly in many journals and publications, including several European newspapers. She lectures regularly. Dr. Caldicott has Napoleoni provide an overview of her 2009 lecture in Madrid about the economic problems of the world. Napoleoni discusses unemployment in Spain, President Zapatero’s progressive commitment to green power, and the opportunity for Spain to lead Europe in transitioning to a renewable energy economy. Napoleoni says that with a sensible plan of economic conversion, many workers in Spain can be trained to work in the green sector. 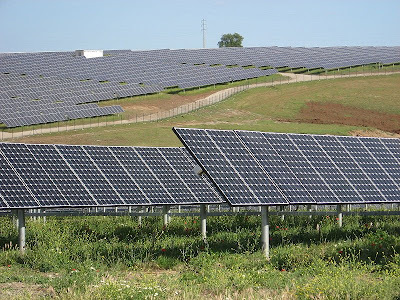 Spain’s laudable goal is to obtain 43% of its energy from renewables by 2012. Napoleoni addresses the huge expansion in solar energy in Spain, Portugal and Greece, and the expanding role of wind power in Europe. Dr. Caldicott and Napoleoni next look at nuclear power in Europe, including the skyrocketing costs of constructing new plants and maintaining old ones, radioactive waste, the near-meltdown at a Sweden reactor three years ago, how Italy receives 40-50% of its power from French nuclear plants, and Dr. Winfrid Eisenberg’s study finding that children living near German nuclear reactors have higher incidences of cancer and leukemia. They examine the problem of nuclear weapons proliferation that results whenever countries buy the technology for nuclear power. Napoleoni provides some shocking information about North Korean/U.S. negotiations regarding North Korea’s nuclear weapons ambitions. She points to the need for a new paradigm for international policy involving total denuclearization, and how the U.S. should lead such a foreign policy revolution. They also explore the role of women, U.S. weapons sales to terrorist groups, and Australian uranium mining. Dr. Caldicott and Napoleoni agree on the absolute need to stand for the “utopian” goal of world disarmament if the earth is to survive. Dr. Winfrid Eisenberg about cancer near nuclear reactors. Read the article Nuclear Scare: How Close Did Sweden Come to Disaster? After a musical break, Dr. Caldicott reads from the chapter entitled “The Manufacture of Consent” in her new book If You Love This Planet. She covers the influence of transnational corporations and the history of corporate propaganda. Dr. Caldicott’s research for this chapter is based on the work of Australian sociologist Alex Carey. Hear a two-part radio program, Alex Carey: Corporations and Propaganda, based on Carey’s writings. This entry was posted on Monday, November 30th, 2009 at 12:00 am	and is filed under Uncategorized. You can follow any responses to this entry through the RSS 2.0 feed. Both comments and pings are currently closed.